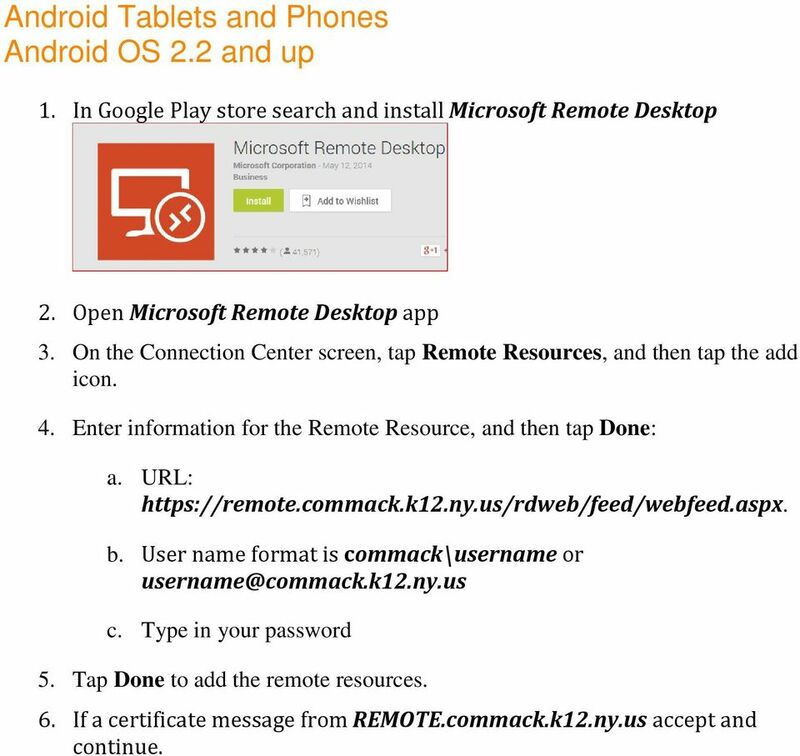 Download "Commack UFSD Remote Access for Microsoft Windows Vista, 7 and 8 Apple Macs, ipads, iphones And Android devices"
1 Commack UFSD Remote Access for Microsoft Windows Vista, 7 and 8 Apple Macs, ipads, iphones And Android devices This allows district staff and students to access the Commack UFSD network from home or anywhere outside of the district with a broadband connection. What is Remote Access? 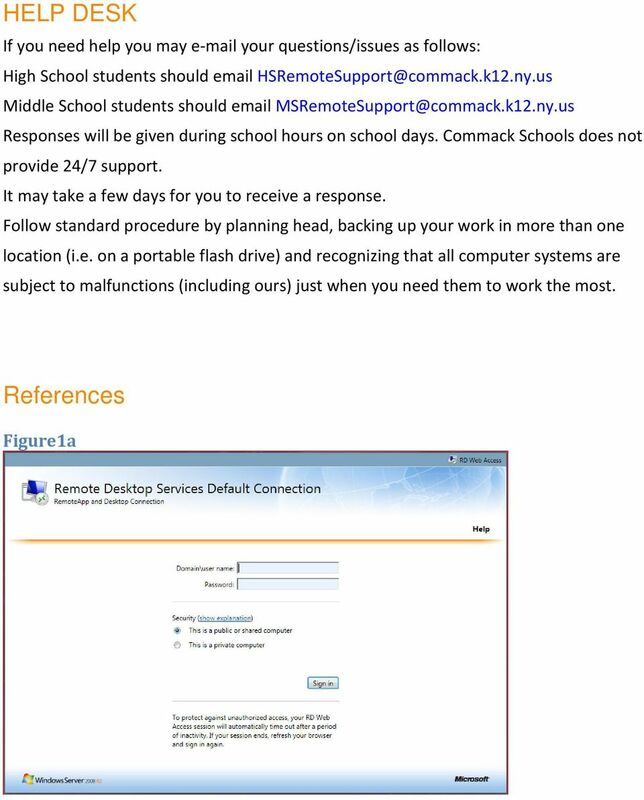 Remote access is the ability to connect through the Internet to resources such as data folders and software applications located on the Commack network. You will be able to access your home folder (H:) as well as public folders so that you can retrieve and send files to and from home. 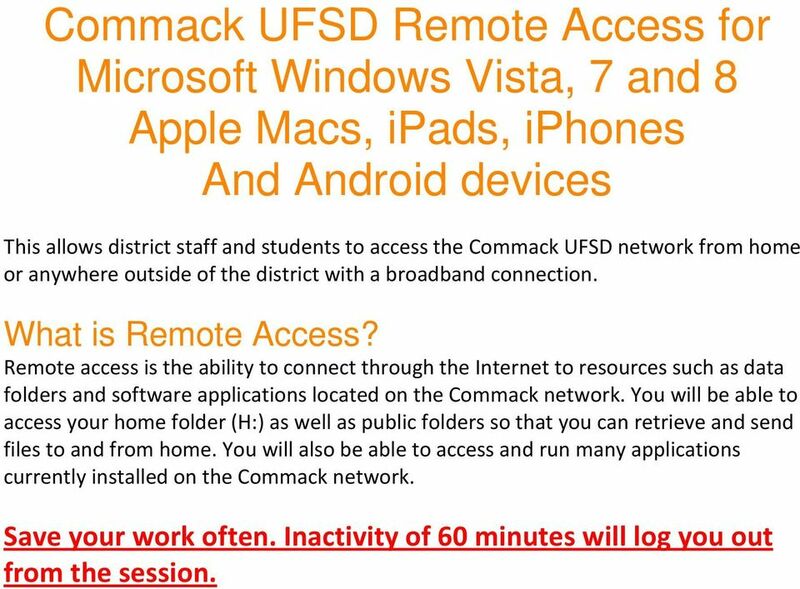 You will also be able to access and run many applications currently installed on the Commack network. Save your work often. Inactivity of 60 minutes will log you out from the session. 2 Microsoft Windows Vista, 7 and 8 1. Internet Explorer 9, 10 or 11. Other web browsers are not supported. 2. 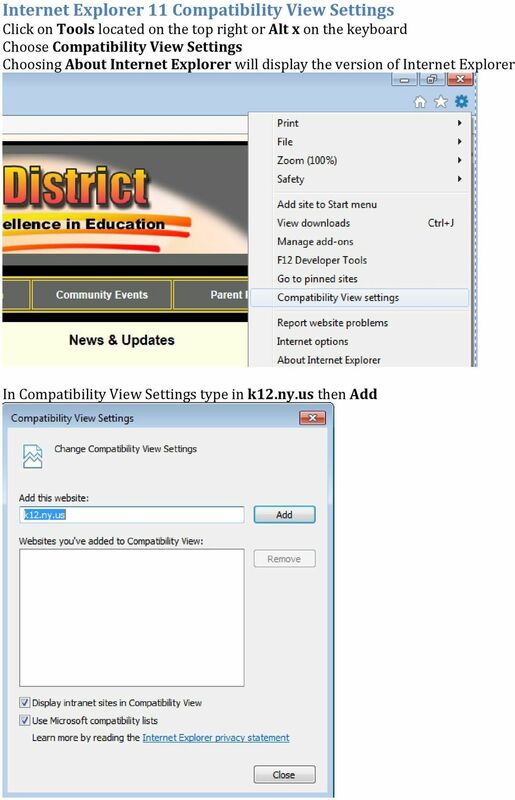 Internet Explorer 10 or 11 may need to add k12.ny.us in compatibility view settings. Scroll to the bottom of the page for directions. 3. Open Internet Explorer and type in the address bar: 4. If this message appears: This webpage wants to run the following add-on: Microsoft Remote Desktop Services Web Access Con from Microsoft Corporation. Choose Allow 5. 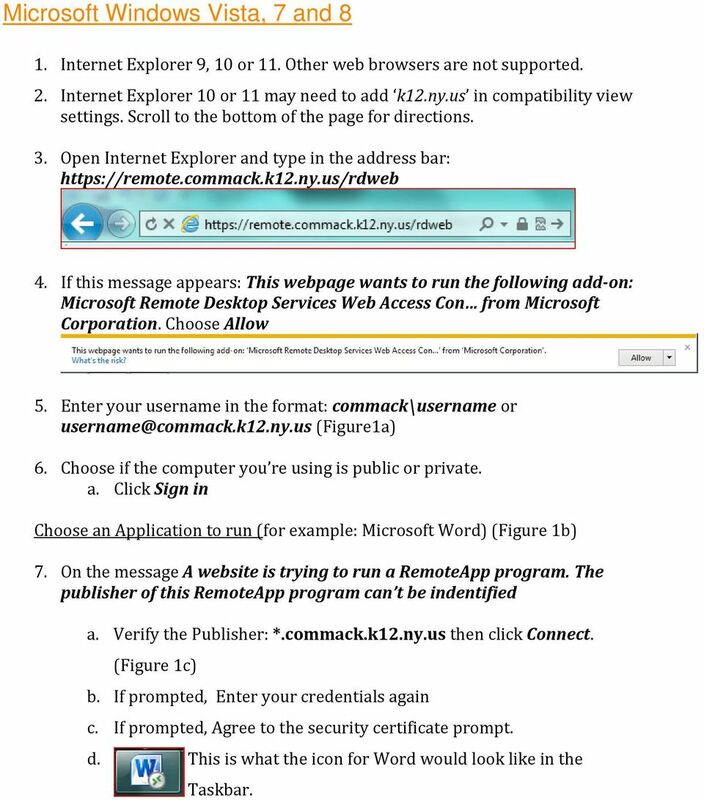 Enter your username in the format: commack\username or (Figure1a) 6. Choose if the computer you re using is public or private. a. Click Sign in Choose an Application to run (for example: Microsoft Word) (Figure 1b) 7. On the message A website is trying to run a RemoteApp program. 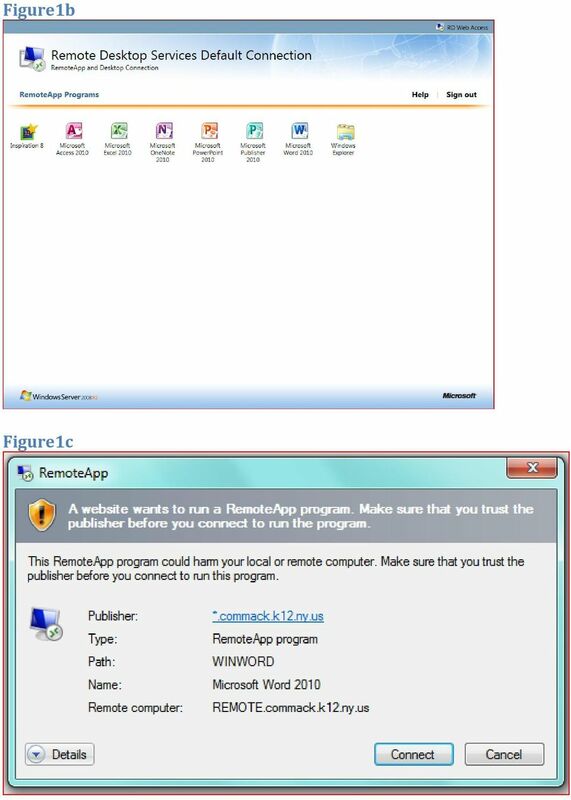 The publisher of this RemoteApp program can t be indentified a. Verify the Publisher: *.commack.k12.ny.us then click Connect. (Figure 1c) b. If prompted, Enter your credentials again c. If prompted, Agree to the security certificate prompt. d. This is what the icon for Word would look like in the Taskbar. 5 Android Tablets and Phones Android OS 2.2 and up 1. 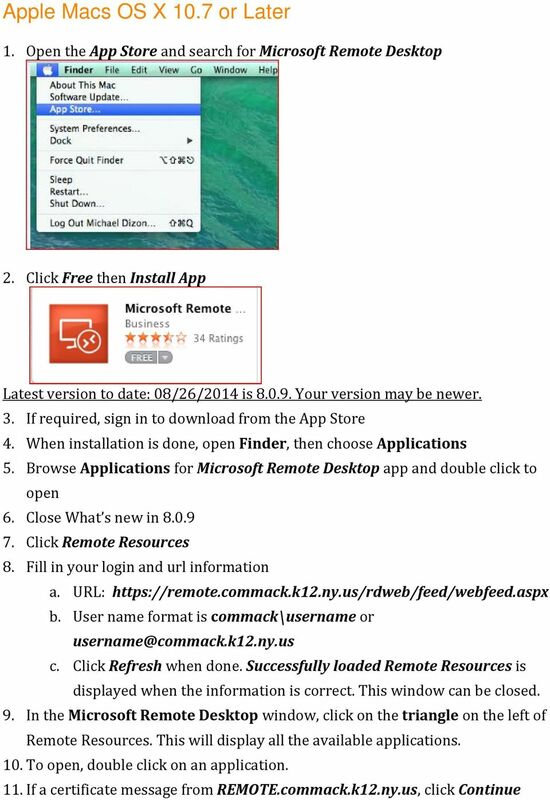 In Google Play store search and install Microsoft Remote Desktop 2. 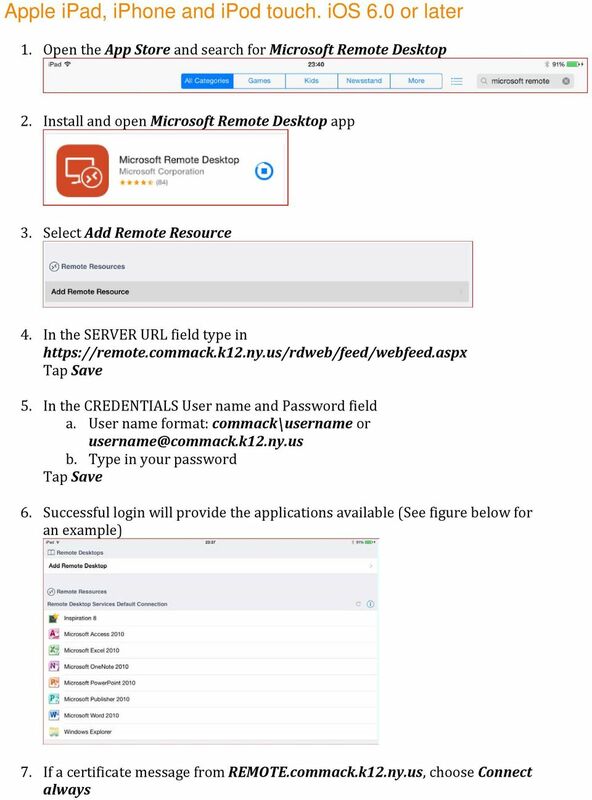 Open Microsoft Remote Desktop app 3. On the Connection Center screen, tap Remote Resources, and then tap the add icon. 4. Enter information for the Remote Resource, and then tap Done: a. URL: b. User name format is commack\username or c. Type in your password 5. Tap Done to add the remote resources. 6. If a certificate message from REMOTE.commack.k12.ny.us accept and continue. MERLIN SERVER. The Quick Start Guide for collaborative project management. 2012 ProjectWizards GmbH, Melle, Germany. All rights reserved. MERLIN SERVER The Quick Start Guide for collaborative project management 2012 ProjectWizards GmbH, Melle, Germany. All rights reserved. INTRODUCTION Welcome to this quick start guide for Merlin Server! Remote Desktop Gateway. Accessing a Campus Managed Device (Windows Only) from home. Information Technology Services. Your mailbox is moving to the cloud. Here is what to expect. TELUS Business Connect Meeting User Guide. Video Conference. Web Share. B&SC Office 365 Email Microsoft Office 365 In its continuous efforts to provide the highest quality student experience, Bryant & Stratton College is giving students access to a new tool for accessing email. Mobile Communicator for Mobile Devices Quick Reference Guide Hosted Voice Customer Resource Center www.earthlinkbusiness.com/hostedvoice 2015 EarthLink. Trademarks are property of their respective owners.